U.S. stocks posted modest gains on Friday, paring four days of declines, after investors cheered unexpectedly strong factory output and consumer sentiment data, overshadowing worries about potential trade wars. Earlier in the week, President Trump ignited concerns after proposing $60B worth of tariffs on Chinese imported goods and ousted Secretary of State Rex Tillerson in favor of Michael Pompeo. The S&P 500 ended its longest losing streak of the year, led by energy stocks as crude oil futures spiked almost 2% to end the week above $62 per barrel. Friday marked the quarterly quadruple expiration of index and options contracts, with heightened trading volume the main result. Total share volume was 9.25 billion shares, the largest-volume session since February 9 and the fifth-highest day of 2018. For the week, the S&P 500 fell -1.20%, the Dow Industrials declined -1.54% and the MSCI EAFE (developed international) gained +0.20%. 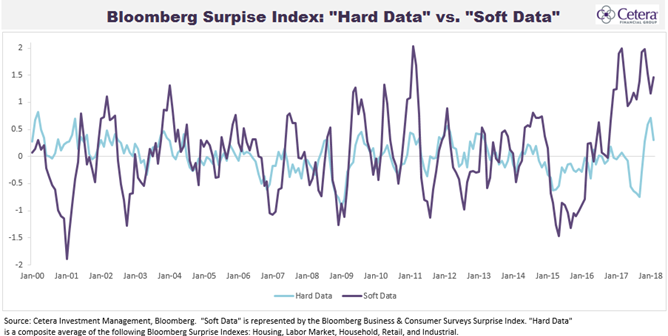 The Chart above shows a comparison between the Bloomberg Surprise Index for "soft data" and "hard data." The soft data is represented by the Bloomberg Business & Consumer Surveys Surprise Index, while the hard data is a composite average of the Bloomberg Surprise Index for Housing, Labor, Personal Household, Retail, and Industrial sectors. There has been a sizeable gap between the surprise index for hard and soft data over the last year. Consumer and business sentiment readings have been largely ahead of expectations by a wide margin. This is evident as consumer confidence and manufacturing PMI's have both reached their highest levels in over a decade in recent months. Meanwhile, hard data has not been as strong, and while there has been improvement in labor data, housing starts, and industrial production, the results have largely been in-line or only slightly ahead of expectations. Business and consumer sentiment readings are likely to remain strong in the near-term because of tax reform, rising earnings, solid growth in housing values, and a bull market that is the second longest on record. We will see in the coming months if the hard data can catch up with the elevated sentiment from consumers and businesses.